Welcome to a WOMEN ONLY running event! 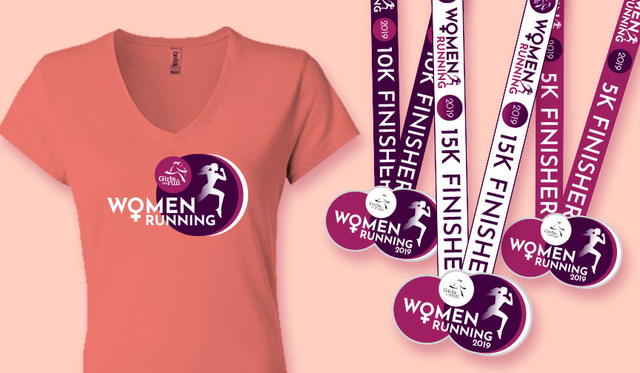 The Women Running 5k, 10k and 15k is just for YOU! Run or walk with women from across the Metroplex! Make Mother's Day weekend THE BEST with a run or walk with your Mom and women in your life! Ladies - choose the 5k, 10k and 15k distance and get ready to run or walk in this event created JUST FOR YOU! Age group awards, great swag and a post race gathering of vendors will be ready for YOU! Bring your friends, the strollers, and your friendly four legged run partners and lets have a blast! The event begins at 8:00am in front of the Keller Town Hall - see you there! The awards will be three deep per age group with individual awards for overall female, overall masters female and overall grand masters female. Overall Female Finisher Awards and Age Group Awards are based on gun time for running events and chip time for triathlon events. The 5k course is an out and back, chip timed event. Timing chips are located on the back of your race bib you will receive at packet pick up. 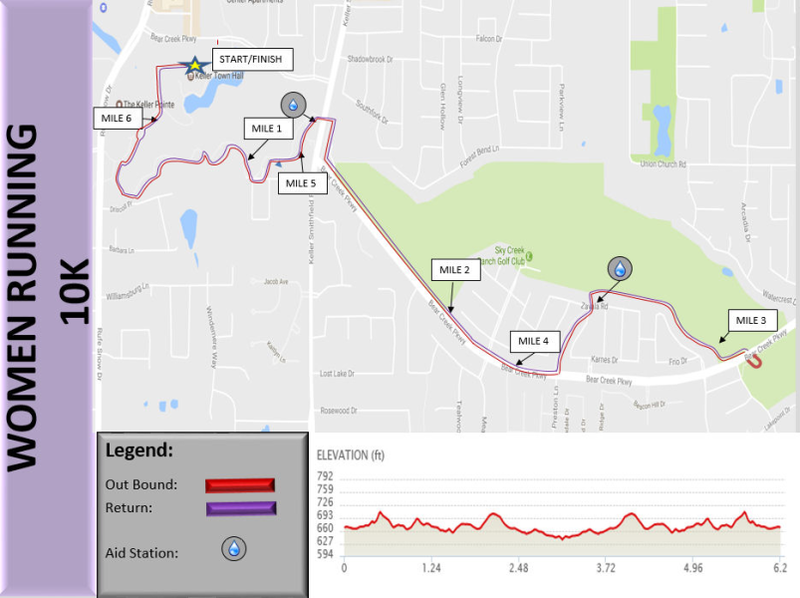 The 10k course is an out and back, chip timed event. Timing chips are located on the back of your race bib you will receive at packet pick up. 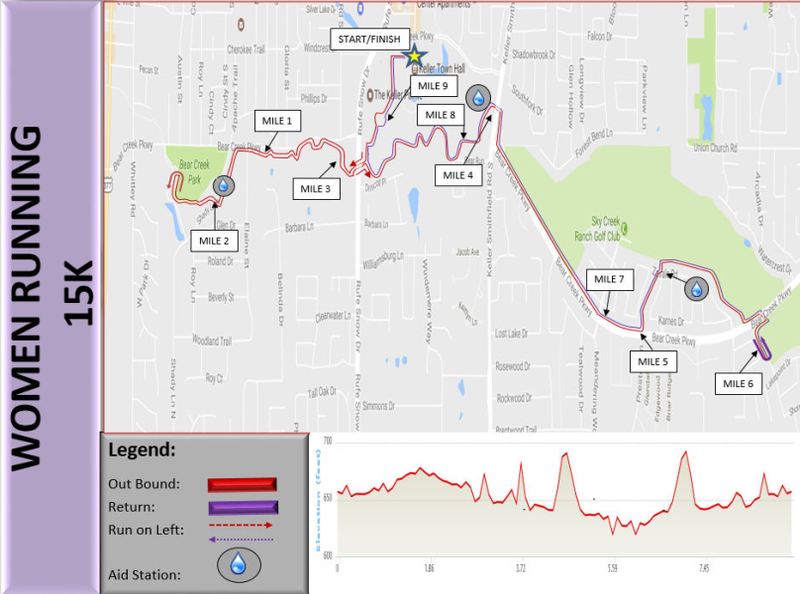 The 15k course is an out and back, chip timed event. Timing chips are located on the back of your race bib you will receive at packet pick up. 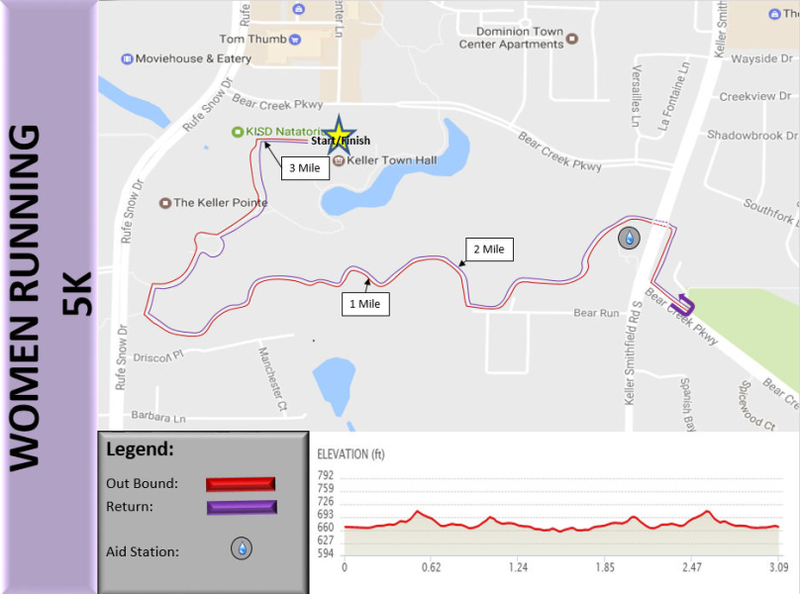 The 15k course will close 3 hours after the 8:00am start. Packet pick up will be announced the week of the event.